Today's Scot Food Fort theme is 'drinks party' - which couldn't be more apt for a Saturday night. But, let's be honest, if you're having pre drinks at home whilst getting ready to go out on the town the getting ready is the part that takes the most time, you don't want to be spending the whole night doing cocktails. And if you're having a genuine, stay-in-all-night drinks party, your guests and the chat are still far more important that making the cocktail. 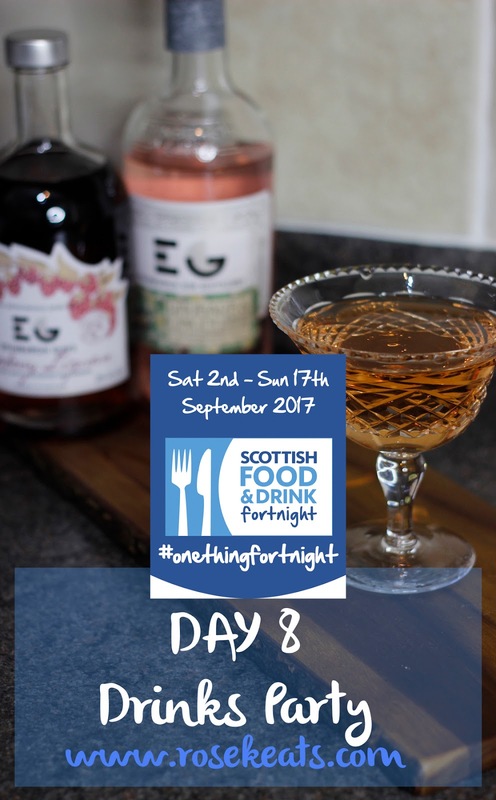 So with that in mind I have two super easy cocktail recipes that you can whip up with no shaking or blending required - and both use a different one of the Edinburgh Gin Liqueurs. Now, I should say the friend who gave me this recipe did say it's best served over ice, but I forgot to make the ice in advanced - and mine was totally fine without! You simple pour a wash of the lime cordial into the glass, add 50ml of your Edinburgh Gin Rhubarb and Ginger Liqueur, top up to being full with the Ginger Ale and add a fresh lime wedge - and you're good to go. Refreshing and sharp, with a hint of kick from the ginger but fruity and instantly drinkable. If even the above recipe is a bit too much work for you, simple try 25ml of the Edinburgh Gin Raspberry Liqueur and top till full with prosecco, top tip being that because the raspberry taste infuses through you can actually use a cheap prosecco - I got the Waitrose own brand one.